Are you forced to use different instant messaging clients for your different contacts? One department uses AOL Instant Messenger, a few friends use Yahoo Messenger, and so on...until your screen is full of IM windows. 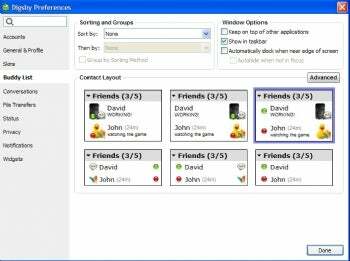 If this is driving you around the bend , you'll appreciate Digsby (free), a universal instant messenger that lets you communicate with people using many different instant messaging programs, including AIM, Windows Live Messenger, Yahoo, ICQ, Google Talk, Jabber, and Facebook Chat. Digsby lets you communicate with people on many different instant messaging networks--in just one program. Digsby does more than that as well--it also integrates with social networking sites including Facebook. You can also send SMS messages to mobile phones, and you can log your conversation history. If you want to see any of your contact's current status, just highlight them, and you get details. It's quite simple to set up all your accounts so that you can check them all from within Digsby. (That said, it's a little too simple to set up unwanted software--see below.) In addition, you can use the key features of each individual IM program, such as sending files via instant messaging. If you're not careful during the installation process, you may end up with a lot of software on your PC without realizing it. During installation at defaults, Digsby install a half dozen pieces of software on your PC, including the Yahoo Toolbar and the NetFreeze Assistant on your PC. So if you don't want them installed, make sure to click Decline each andy every time. Also, it will attempt to change your search page to My.Freeze.com, and install various icons on your desktop that links to sponsor unless you uncheck those options during installation. In addition, in order to install it, you must use the InstallIQ installer, which some people have called adware. This newest version of Digsby adds lots of extras, such as new emoticons and improved support for Twitter and MySpace. The vendor claims that it also cuts CPU use significantly and improves the reliability of file transfers. Note: This link takes you to the vendor's site, where you can download the latest version of the software. The software will attempt to install many other programs; if you don't want them, make sure to uncheck the boxes during installation.